This recipe is shared by Fati Naz. She is master in baking and you can follow her recipes without any doubt. 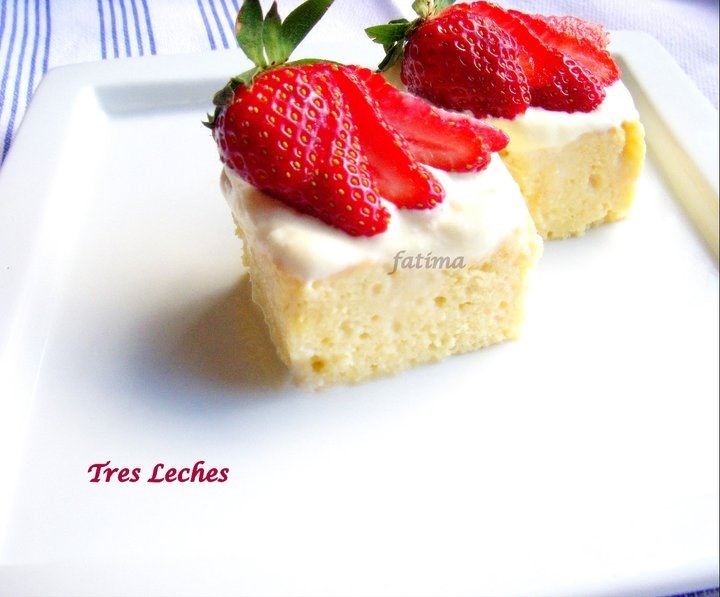 Tres leches is a sponge cake soaked in a mixture of three kinds of milk. Evaporated milk, condensed milk, and heavy cream. You can never forget the taste of this cake. Sift flour and salt and set aside. Separate egg whites and yolks. Now beat egg whites with 1/4 cup sugar until stiff keep aside. Beat egg yolks with 1/4 cup sugar and vanilla essence until light in color. Fold yolk mixture into egg whites. With soft hands fold the flour in egg mixture. Bake at 350 degrees F (175 degrees C) for 25- 30 minutes.or keep checking until brown from top. Cool for 10-15 minutes. Pierce cake several times with a fork. In a bowl, stir together the heavy cream, evaporated milk and sweetened condensed milk. Pour the mixture over the cake until all absorbed.Refrigerate cake overnight for best results. Place the heavy cream, sugar and vanilla into the bowl . Using the whisk attachment, whisk together on low until stiff peaks are formed. Change to medium speed and whisk until thick. I garnished mine with sliced strawberries. You can garnish with any fruit like peaches, cherries etc.